Gimpel Fils is delighted to announce the forthcoming exhibition Jankel Adler Works on Paper Paper Part II. Following on from our 2012 Adler exhibition, Part II provides a more detailed investigation into Adler's works on paper and in particular his portrait studies. The sitters, who are patrons, friends or models, share the thoughtful, even melancholic look appropriate to the period in which they were depicted, the forties. 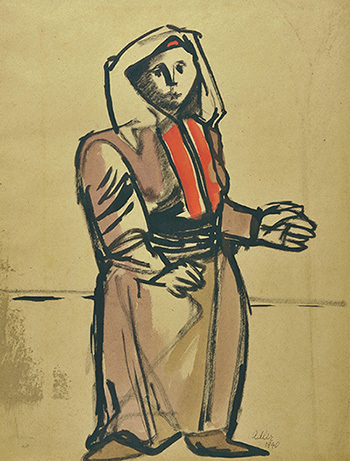 Jankel (1895-1949) was one of the most respected Jewish artists of his generation. Born in Poland, he studied and painted for many years in Dusseldorf, where he also taught at the Modern Academy. In 1918 he was one of the founders of the Ing Idisz (Young Yiddish) group, an association of painters and writers in Lódz dedicated to the expression of their Jewish identity. The influence of Jewish calligraphy can be found in many of his early works, which also incorporate formal, stylistic and technical elements derived from avant-garde practices, including German Expressionism, Picasso and Cubism, and Constructivism. Adler had his first exhibition at Gimpel Fils in March 1947, displaying works inspired by the writings of Franz Kafka. Gimpel Fils had opened in November the previous year and Adler's display was the third exhibition in the gallery's history. A second solo show followed in 1948, which included a selection of oil paintings, gouaches and drawings.